Congratulations to the Coachford AFC Premier team who won the Cork AUL Premier league title for the first time in the club’s history. The team managed and coached by Michael Walsh and Donal Moynihan created club history tonight by beating AOH Cup winners Killumney United by a single goal. This last game of the season turned out to be the title decider as both teams were level on points. In the first half Coachford were under severe pressure as the physically stronger Killumney side had the wind advantage and piled long balls on top of the Coachford defence for long periods of the first half. On 15 minutes Coachford lost the influential player, Pa Finnegan to a hamstring injury. Coachford weathered the storm with some brilliant defending and had a few chances themselves at breaking the deadlock but really the first 45 minutes belonged to Killumney. 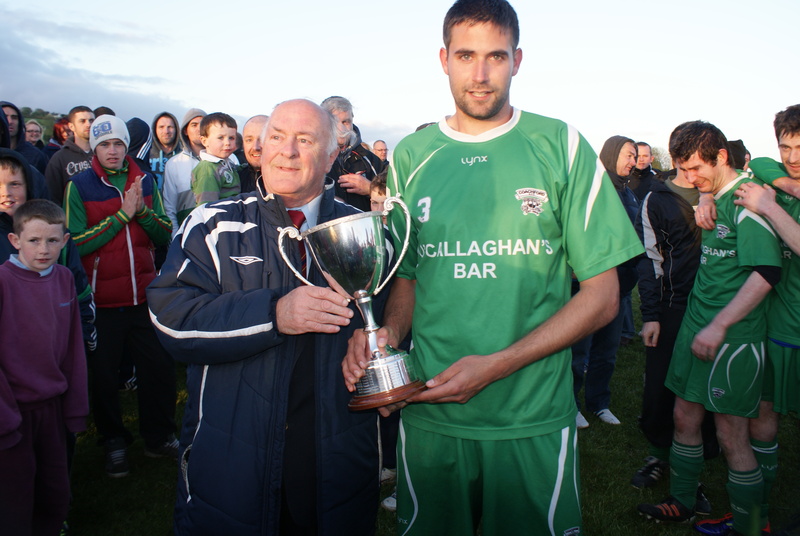 Club Chairman Thady Delaney said ” what a victory, this is huge for the club. They are a great bunch of players, every one of them. Welshie (Mick Walsh) and moyny (Donal Moynihan) had them well prepared and although the first half was tough going they always seemed to have enough to win this. We’ve had some tough times in our club and we’ve also enjoyed many good days but this has to be one of the best of them all. We’ve had a great year with the under 12s and 13s winning their leagues and the under 15s gaining promotion and now this. But all this success is on the back of huge amount of work right throughout the club and everyone can be proud of playing their part in tonight’s and all the other victories we’ve enjoyed this season”. how tall are these guys? yeah three of them and we’d have another goal – in GAA! This entry was posted in Useful Numbers and tagged AOH Cup Winners, Coachford AFC, Coachford soccer, Donal Moynihan, Keith Linzell, Kilumney, Michael Walsh, Pa Finnegan, Peter O'Riordan, Premier League Champions, Thady Delaney. Bookmark the permalink.